So this morning I was cruising around my dashboard on Tumblr, looking at the requisite pictures of airy interiors and the Olsen twins, when I scrolled past a pretty brunette in a floral dress, with a chubby French Bulldog on a bright green leash. I was immediately smitten with her look, her hair and her adorable dog. To find the origin of this photo, I had to click back through about 12 or so reblogs to find the source: a sweet, bilingual personal style blog called Lovely Pepa. I believe Alexandra and her dog Pepa are Spanish, which explains the Spanish and English text, her European flair for dress and gorgeous photo locations. She makes me want to grow my bangs out, like, now. And get a dog. Digging that starfish cuff pretty seriously. Give me a break! 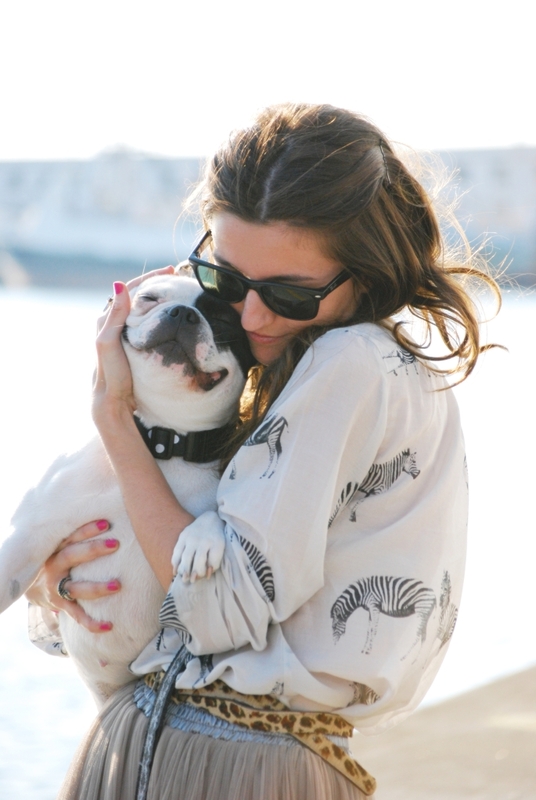 That is an amazing blouse and literally the cutest dog I have ever seen. What really gets me about this blog too is that Alexandra wears very minimal make up, doesn't always wear sunglasses, and is incredibly smile-y. We all fall victim to the serious face sometimes, but it's great to see a girl getting dressed up, taking her dog for a walk, and seeming so genuinely happy about it all. Girlfriend also has more pairs of Ray Ban sunglasses than I've ever seen on one blog, which is also a treat (and I'm totally jealous). Take a break for yourself today and browse through Lovely Pepa's inspiring style and really photogenic canine pal. Awesome post! I'm obsessed with that starfish bracelet as well. I think it's from anthro! Thanks for the fashion inspiration. She's adorbs! I adore that zebra top and the starfish bracelet. Thanks for introducing me to her blog! OK...well...I am TOTALLY going to check out his adorable girls blog....how cute is she..and you are right (even tho I fall victim too) it is so NICE to see someone smile on a blog...lol. So many serious fashionistas. anyway...enjoying your posts and be back soon.